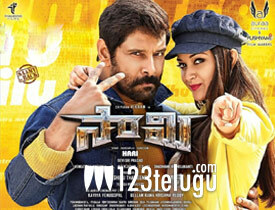 Starring Chiyaan Vikram and Keerthy Suresh, Saamy has hit the big screens in the Telugu states today. The trailer was filled with action episodes and that raised the curiosity factor for the movie-goers. Scroll down to check whether the movie lives up to the expectations or not. Chiyaan Vikram comes up with an energetic performance in the role of a straightforward police officer. His aggression and screen presence is a big plus to the movie. Also, he looks dynamic and proves that he can carry out such roles with ease. Keerthy Suresh has a very limited screen presence but she looks really beautiful on screen. In a few scenes, Keerthy is seen with minimal makeup but she manages to pull it off with her subtle acting skills. A few confrontational scenes between Vikram and Bobby look impressive and raise the excitement factor to an extent. The supporting cast has come up with natural performances and that gives an authentic vibe to the proceedings. Gone are the days when the audiences rushed to the theaters to watch a typical mass masala entertainer. But looks like the director, Hari, is yet to acknowledge this fact. He sticks to the routine revenge drama style of narrative and messes it up further with over the top fight sequences every now and then. There are around 4 to 5 lengthy comedy episodes in the movie and none of them are even giggle-worthy. In fact, this meaningless comedy tests the patience of the viewers. The amount of Tamil flavor is just too much to handle. The movie opens with a confusing narrative as a majority of the Telugu audience do not know what happened in the prequel of the movie which was released only in Tamil. This gives the movie a dull start, taking a toll on the viewing experience. The director, Hari, dishes out a routine action drama with too much Tamil flavor in it. His storyline has nothing new to offer and so is his narrative. The director used a similar formula for Surya’s Yamudu and scored brownie points but that is not the case now. Music by Devi Sri Prasad is just above okay. Two songs are good to hear and have repeat value. However, his background score is too loud. The production values are good for this medium-budget action entertainer. The visuals look rich and attractive, thanks to some impressive work from the men behind the cameras. On the whole, Saamy is a routine action drama that has nothing new to offer. Vikram comes up with a great performance as a cop but the movie is filled with unappealing action episodes which look over the top. All those who like such loud cop dramas can try this film out but the rest can look for something else this weekend.